Kunstverein Göttingen presents and supports contemporary visual art, while offering a broad range of art education programs. With its program of exhibitions and events, the institution is well-established within the cultural landscape of Göttingen—and enjoys a reputation extending well beyond. The program of the Kunstverein focuses on the work of young contemporary artists from Germany and abroad who work in an international context—and often presenting an artist’s first institutional exhibition in Germany. More established artists are also invited to take part in selected exhibitions, and in the university city of the Kunstverein serves as a meeting point and place of dialogue between the worlds of art and academic research. Exhibitions take place in two venues. One is a former residential and office building dated 1742, now the Künstlerhaus (Lichtenberghaus), where the mathematician Georg Christoph Lichtenberg (1743 – 1799) lived and taught. This building also houses the offices of the Kunstverein. Exhibitions alternately take place in the Alte Rathaus, or old city hall, whose original structure dates from 1270. Its reception hall, intricately decorated with the historicizing murals (1883) of Hermann Schaper, is one of the city’s most popular landmarks. Five exhibitions a year reflecting the most exciting developments in contemporary art and cultural dialogue – encompassing a range of themes and media – are presented in these two historical buildings. A comprehensive program of events, tours, artist talks, and education programs for children and youth accompanies each exhibition. The Kunstverein also organizes membership trips to major exhibitions and artist studios and operates an Artothek, or “lending library” for art, with a collection of works focusing on modern and contemporary prints that are available for loan. Founded in 1968, Kunstverein Göttingen has realized numerous exhibitions to date, and its exhibition history includes artists such as Marc Brandenburg, Christian Jankowski, Andreas Schimanski, Sophia Tabatadze, and Nina Canell. 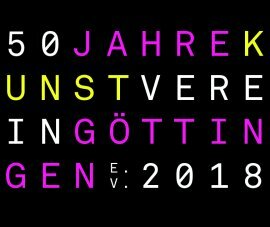 Kunstverein Göttingen is committed to a lively exchange surrounding relevant issues and developments in contemporary art and invites the public to engage in an open dialogue with artists and cultural producers of all disciplines. Situated in a renowned university city, Kunstverein Göttingen provides a forum for its members and visitors to encounter outstanding works of art and experience the visual arts as a key to broader issues of social and cultural debate. With a membership you support our commitment to young and contemporary art in Göttingen. We offer our members a wide range of annual gifts at advantageous conditions. You can find regular publications on our exhibitions here. Our team introduces itself. We look forward to hearing from you. The Kunstverein Göttingen thrives on the active participation of its members and the indispensable commitment of its donors, supporters and sponsors.